During the search for the P/E Boundary-GSSP, confusion has evolved concerning the events characterising the P/E Boundary in terms of calcareous nannofossil biostratigraphy. Authors have variously reported the boundary as occurring in NP9 or NP10. This is essentially based on different morphologic interpretations of the nannoliths of the genera Rhomboaster and Tribrachiatus. It is in the interest of the scientific community that calcareous nannofossil specialists agree on a common interpretation of similar observations. Subdivision of the P/E Boundary Interval by calcareous nannofossils is based on a lineage of nanofossils in which the ±rhombohedral, Palaeocene genus Rhomboaster, evolved into the double-triradiate, Eocene genus Tribrachiatus. The first occurrence (FO) of R. bramlettei was chosen by Martini 1971 as defining the base of the calcareous nannofossil zone NP10, which often was used as an approximation of the P/E Boundary. The identity and systematic position of the marker species has been discussed by various authors and their different viewpoints have lead to different interpretations of the same data, leading to confusion in the scientific community and even to the premature conclusion that calcareous nannofossil biostratigraphy is of little use in the P/E Boundary interval. After the descriptions of the holotypes mainly in the 1960ies and 70ies (Fig. 1), attempts at synthesising the observations have been made by producing line drawings by Romein 1979, Perch-Nielsen et al. 1978, Perch-Nielsen 1985, Angori & Monechi 1996, Bybell & Self-Trail, 1995, 1997 and Wei & Zhong 1996 illustrated specimens in different orientations. Bybell & Self-Trail 1995, 1997 and Wei & Zhong 1996 produced and illustrated clay models while Aubry & Requirand 1999 showed models at the conference in Goteborg. 3-D computer models were developed for this study (Fig. 2 and von Salis et al. 1999). These computer models were constructed using a simple geometric model in order to test the hypothesis that the range of morphotypes from a simple rhomb through R. cuspis to R. bramlettei and R. calcitrapa could be developed simply altering a single parameter, spine length. The models as shown in figure 2 were developed on this basis (except the T. contortus model where the interlayer angle was changed). We believe these models are realistic representations of the observed morphologies and so conclude that there is no significant difference in structure within the cuspis-bramlettei-calcitrapa continuum and that they should all be included in the same genus. R. cuspis: "Specimens with edges indicating a rhombohedral symmetry, but with faces depressed, usually strongly concave and cuspate corners extended like spines" Bramlette & Sullivan, 1961, original description). R. bramlettei (including R. calcitrapa and R. bitrifida, both of which feature longer free rays than R. cuspis). Body, a deformed rhombohedron, with 6 long rays distributed on two levels with 3 rays each, 60° between all rays in top view and two "flattened corners of a rhombohedron". R. spineus: Small central, deformed rhombohedron with (long) rays having lateral spines. T. digitalis: Triradiate form with long pointed bifurcations. Each ray essentially located in the same plane and spacing between the rays occurs at a narrow angle. T. contortus: Double-triradiate form with an angle of ca. 15°-45° between the two superimposed layers with three rays each. The last occurrence of T. tribrachiatus defines the base of NP13. the last appearance of T. contortus defines the base of NP11. The total range of T. digitalis defines a subzone in NP10, and has been proposed as a key marker for the base of the Eocene. It is unfortunate that species where a clear distinction - at least in poorly preserved material - is difficult, are assigned to two different genera. There are essentially two problems that are under discussion: A: whether one or both genera should be used. Some authors have argued that they have significantly different structures (e.g. Romein 1979, Aubry 1996 whilst others have argued that differences are inconsequential variations of the same basic structure (e.g. Bybell & Self-Trail 1995, 1997; Angori & Monechi, 1996), B: the identity of the NP10 marker, R./T. bramlettei. Some authors regard R. cuspis and R./T.. bramlettei as discrete species , others regard them as synonyms. 1) We follow Bybell & Self-Trail 1995, 1997 and use only Rhomboaster, a solution which was not accepted by Angori & Monechi 1996, Aubry 1996 and Wei & Zhong 1996 who all cited and discussed them. Unlikely to be accepted. 2) We continue to use Rhomboaster and Tribrachiatus, as supported by Angori & Monechi 1996, Aubry 1996 and Wei & Zhong 1996. A key argument is that Aubry 1996, following Romein 1979, considers the structure of Rhomboaster to be intrinsically different from that of Tribrachiatus. We argue here based on our reconstructions this is not the case and so distinction of two genera constitutes subjective subdivision of a single lineage. Nonetheless, this distinction may or may not be judged useful. 1) Avoid the problem by changing the definition of the base of NP10 to lie at the FO of Rhomboaster. The advantage would be that the boundary of NP9/NP10 would remain stable and the main P/E Boundary events would consistently fall above it. 2) We show convincingly that R. cuspis and R/T. bramlettei can consistently be distinguished. This will not be easy and some authors will certainly disagree. 3) We elect the "foolproof" solution suggested by Bybell and Self-Trail 1995, 1997. By including R. cuspis in R. bramlettei , the lower boundary of NP10 automatically lies at the FO of the first Rhomboaster species. Equals ± solution under 1). This solution has the advantage that, regardless of the state of preservation of the calcareous nannofossils, the lowermost Rhomboaster defines the base of NP10. The P/E Boundary events would always fall into NP10 in complete sections. 4) We agree on a "solomonic" solution by making two subspecies, R. bramlettei bramlettei and R. bramlettei cuspis. This would have the advantage that we could leave the NP9/NP10 Boundary definition as it is. As argued by Aubry repeatedly there are very good reasons for maintaining stability in zone definitions even if in the light of present knowledge they have not been placed at ideal horizons. At the same time this solution would allow us to indicate that we have found the early form but not the "typical" R. bramlettei. In addition, the boundary would be the same for those authors not distinguishing between the two species/subspecies and for those wanting to distinguish between them and the boundary could also be placed when only poorly preserved material is available. The genus Rhomboaster continues to be used and includes the species R. bramlettei and R. spineus. In order to make it possible to use the sequence of appearance of first specimens with corners before specimens with rays we distinguish between R. bramlettei bramlettei with rays and R. bramlettei cuspis with corners. The NP9/NP10 Boundary remains as originally defined. Animated GIF "moving images" of Rhomboaster and Tribrachiatus as shown in Fig.2 can be seen on the International Nannoplankton Association website http://www.nhm.ac.uk/hosted_sites/ina/rhomboaster. In addition the geometrical model used and wireframe calculation spreadsheet are documented on the web site and the models can be downloaded for interactive exploration on a MacIntosh computer. Angori, E. & Monechi, S., 1996: High resolution calcareous nannofossil biostratigraphy across the Paleocene/Eocene boundary at Caravaca (southern Spain). Israel. J. of Earth Sc. 44:, 197-206. Aubry, M.-P., 1996: Towards an Upper Paleocene-Lower Eocene High Resolution Stratigraphy Based on Calcarous Nannofossil Stratigraphy. Israel. J. of Earth Sc. 44, 239- 253. Aubry, M.-P. & Requirand, C.,1999: The Rhomboaster-Tribrachiatus lineage: a remarkable moment in the evolution of the calcareous nannoplankton. In F.P. Andreasson, B. Schmitz & E.I. Thompson (eds): Early Paleogene warm climates and biosphere dynamics. Earth Sciences Centre, Göteborg University C21 1999. 2pp. Bramlette, M.N. 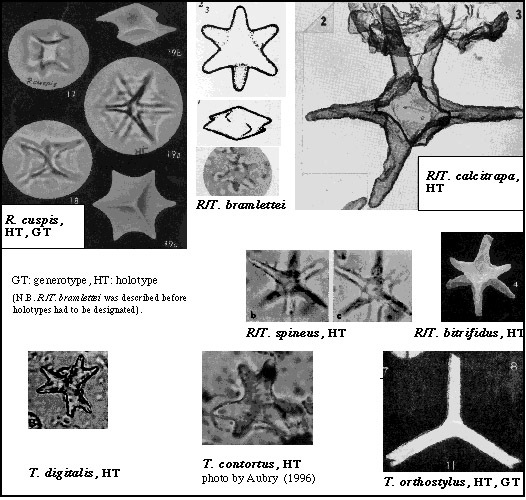 & Sullivan, F.R., 1961: Coccolithophorids and related nannoplankton of the Early Tertiary in California. Micropaleontology, 7, 129-174. Bybell, L.M. & Self-Trail, J.M., 1995: Evolutionary, Biostratigraphic, and Taxonomic Study of Calcareous Nannofossils from a Continous Paleocene-Eocene Boundary Section in New Jersey. U.S. Geol. Survey Prof. Paper 1554, 1-36. Bybell, L.M. & Self-Trail, J.M. , 1997: Late Paleocene and early Eocene calcareous nannofssils from three boreholes in an onshore-offshore transect from New Jersey to the Atlantic continental rise. Proc. ODP Sc.Res. 150X, 91-110. Martini, E., 1971: Standard Tertiary and Quaternary calcareous nannoplankton zonation. In: Farinacci, A. (Ed.) Proceedings 2nd Planktonic Conference, Roma, 1970, 2, 739-785. Perch-Nielsen, K., 1985: Cenozoic calcareous nannofossils. In: H.M. Bolli, J.B. Saunders & K. Perch-Nielsen (eds): Plankton Stratigraphy. Cambridge University Press, 427-554. Perch-Nielsen, K., Sadek, A., Barakat, M.G. & Teleb, F., 1978: Late Cretaceous and Early Tertiary calcareous nannofossil and planktonic foraminifera zones from Egypt. Actes du VIe Coll. Afr. de Micropal., Tunis. Ann. Mines et Géol. 28/II, 337-403. Romein, A.J.T., 1979: Lineages in early Paleogene calcareous nannoplankton. Utrecht Micropal. Bull., 22, 1-231.
von Salis, K., Monechi, S., Bybell, L.M., Self-Trail, J. & Young, J., 1999: Rhomboaster/Tribrachiatus - calcareous nannofossil markers at the Paleocene/Eocene Boundary: a base for discussion. In F.P. Andreasson, B. Schmitz & E.I. Thompson (eds): Early Paleogene warm climates and biosphere dynamics. Earth Sciences Centre, Göteborg University C21 1999, 4pp. Wei, W. & Zhong, S., 1996: Taxonomy and magnetobiochronology of Tribrachiatus and Rhomboaster, two genera of calcareous nannofossils. J. Paleont., 70(1), 7-22.